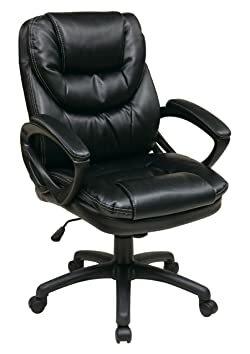 WorkSmart Faux Leather Manager’s Chair by Office Star is not just the faux leather in the chair that draws attention. The mid-back chair packs along a laundry list of features, which along with the price point make this chair a very interesting prospect for your new office. We cut the long route short for you by taking you to every nuance worth note. Ergonomics and office chairs now go hand in hand. Office Star pays keen heed to ergonomics in each of their chairs. The Work Smart Faux Leather chair is no exception. It does not fail to impress ergonomically. Here are the details. An adjustable seat height is always recommended for office chairs. The pneumatic adjustment of the WorkSmart facilitates easy seat height adjustment. The seat height can be adjusted between 19 and 23 inches, depending upon the heights of the user and the workstation. The chair is predominantly a mid-size chair. But tall customers ranging between 6’ and 6’6” have also purchased the chair and found the seat dimensions generous enough. The width of the chair is 25.50 inches and the depth is 26 inches. But these numbers can be misleading as most customers have registered satisfaction over the seat dimensions. A major factor in the ergonomics of an office chair is the kind of support that it provides to the lumbar. In the case of the Work Smart, the faux leather padding in the seat plays a neat role in lumbar support in addition to the remarkably contoured mid-back of the chair. The backrest in a chair is as important as any other feature. And for office chairs in particular, the comfort generated by the backrest is even more necessary. Even at the first glance, you will notice that the backrest of the WorkSmart Faux Leather Manager’s Chair is generously padded on the upper side to extend extra support to the shoulders. But since the chair is a mid-size chair, you cannot expect the backrest to provide that occasional support to the neck. While the Work Smart Manager’s Chair summons impressive features in almost all ergonomic aspects, it is the material of the chair that attracts the most. The chair seat and backrest and made of finely woven faux leather. In fact, you will notice the tight leather-like stitches right at the first glance. The padding under the leather is also standard and adequately comforting. The company has used good quality packing for the chair. Both the seat and the backrest are pretty comforting generally. However, people over 6’ may find the padding to be a little lagging. In such cases, there are several vendors that may supply you with extra cushioning material. While the arm rest has some sort of padding, a tighter press with the elbow reveals the plastic underneath. Assembling is both easy and fun. It does not take more than 20 minutes for a single person to mount up the chair. To great credit of the company, some spare hardware is also provided along with the unit. These come really handy just if something cracks during the assembly. If there is one major downside to this chair, it is the repacking. The chair comes in a tight box and you cannot just have it fit inside the box after you have assembled it already. While disassembling the chair is not a pain, repacking it into the box is definitely one. Good proportion between seat and backrest. Supports heavy weight with ease. Ideal for long office hours. In conclusion, it can be said that this chair is a winner at this affordable price point. Ergonomic points are well addressed and genuine material is used. Apart from the weak arm padding, we could not find any major flaws in the chair. Go for it if you are looking for a budget price.